In 1802, naturalist and painter John Peale unveiled the first mounted fossil skeleton ever put on display in the United States. The mount, a mastodon (Mammut americanum) collected on a farm near Newburgh, New York, immediately captured public attention and inspired a wave of interest in anything old and big. Although Peale charged admission to view the mastodon and somewhat dramatized its importance as “the first of American animals” and “the largest of terrestrial beings”, his primary intent was to educate the public about the natural world. Nevertheless, many American capitalists saw the crowds of people lining up to see Peale’s mastodon and concluded that there was a profit to be made in exhibiting fossils. The best known of these 19th century fossil showmen was surely Albert Koch. Having immigrated to the United States from Germany in 1835, Koch was a contemporary of P.T. Barnum, and like Barnum, he made a career out of exhibiting “curiosities”, some real and some fraudulent or exaggerated. At “Dr. Koch’s” (he never actually earned a doctorate) exhibition hall in St. Louis, Missouri, visitors paying the 50 cent admission fee could view wax sculptures, exotic animals, artifacts from distant countries, extensive miniature dioramas, and alleged freaks of nature. Koch also had a live grizzly bear and several alligators – sources differ on whether or not they were forced to fight for entertainment. In 1840, Koch received word of something much bigger. A Missouri farmer had discovered large fossil bones, and Koch quickly arranged to purchase the find along with the rights to search the farmer’s land for more. 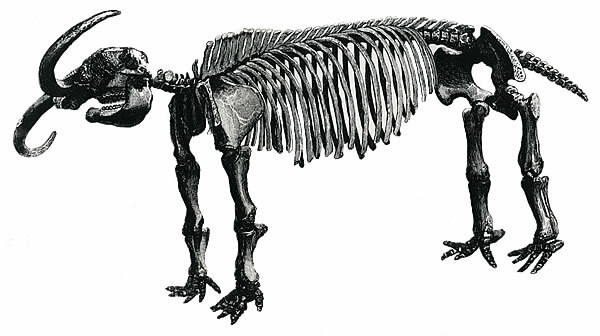 Within four months, Koch had assembled a complete mastodon skeleton. More than complete, actually: Koch’s mount included numerous extra vertebrae and ribs from one or more additional mastodon individuals. Like Peale before him, Koch placed blocks of wood between the vertebrae to further exaggerate the animal’s length. The result was a 32-foot mount, nearly twice as long as a typical mastodon. As a final flourish, Koch positioned the mastodon’s tusks pointing upwards, to make the beast look more fearsome. In order to differentiate his creation from Peale’s earlier exhibit, Koch called the creature “Missourium”, although there was no scientific reason to distinguish it from other mastodon finds. Missourium went on display at Koch’s St. Louis establishment later that same year, and proved to be an instant success. In fact, Koch decided that the composite mastodon mount was worth more than then every other display combined. In 1841, he sold the exhibit hall and took Missourium on tour, traveling to New Orleans, Philadelphia, and several other American cities. Illustration of Missourium. Out-of-copyright image via Laelaps. Contemporary academics, including the British naturalist Richard Owen, pointed out that Koch’s mount was clearly an incorrectly assembled composite, and expressed disapproval for Koch’s sensationalized treatment of important fossil specimens. Just like famous P.T. Barnum frauds like Joice Heth and the Feejee mermaid, however, the controversy surrounding Missourium’s legitimacy only increased the enthusiasm of the paying public. As an interesting side note, Koch claimed to have found stone tools and other human artifacts alongside the Missourium fossils. He included a pamphlet with his traveling exhibit which explained that these tools demonstrated that human populations in North America extended much further back in time than had been previously assumed. Koch may well have been telling the truth about where he found the artifacts and would eventually turn out to be correct about the antiquity of American humans. Nevertheless, because of the obviously fraudulent nature of Missourium, scientists of the day saw fit to ignore Koke’s suggestions entirely. Koch sold Missourium to the British Museum in 1843, but he was soon at it again in 1845, when he began scouring Alabama for new display-worthy fossils. This time, Koch was after the bones of the prehistoric whale Basilosaurus cetoides. The Philadelphia-based naturalist and physician Richard Harlan had first described and named Basilosaurus in 1835 (he erroneously thought it was a reptile, hence the name meaning “king lizard”), but its fossils had been well known in the American south for decades before that. Enslaved men and women often ran into the bones while plowing fields, and these fossils were sometimes used as furniture or foundation posts for houses. Between January and April of 1845, Koch traveled across Clarke, Choctaw, and Washington counties, retrieving Basilosaurus remains. His best find was an articulated partial skeleton, including much of the skull, which he unearthed near the Tombigbee River. After accumulating parts of at least six Basilosaurus individuals, Koch combined the fossils into a 114-foot mount (he would claim that it was 140 feet). Just as he had with Missourium, Koch strung together the vertebrae of multiple animals, extending his creation’s length to an absurd degree. This time, Koch did not even limit himself to whale fossils: as naturalist Jeffries Wyman would point out, many of the elements in Koch’s chimeric creation were actually ammonite shells. Billed as a sea serpent called “Hydrargos sillimani” (named after Yale professor Benjamin Silliman, who was not involved in the project and immediately requested that the reference be removed), the mount was first exhibited at the Apollo Saloon in New York City. Hydrargos, eventually renamed Hyrarchos, proved to be even more popular and profitable than Missourium. Cleverly, Koch had constructed the skeleton not as a single structure but as several modular components secured to wooden boards. This made it easy for the showman to disassemble, transport, and reassemble the display, which he toured throughout the United States and Europe. Illustration of Hydrarchos in New York’s Apollo Saloon. As they had with Missourium, scientists confronted Koch over his inaccurate and sensationalized displays. Undaunted, Koch eventually sold the Hydrarchos mount to the Prussian King Friedrich Wilhelm IV, who exhibited it in Berlin’s Royal Anatomical Museum despite the insistence by the museum’s experts that the mount was a fraudulent reconstruction. Koch was still not finished, however. 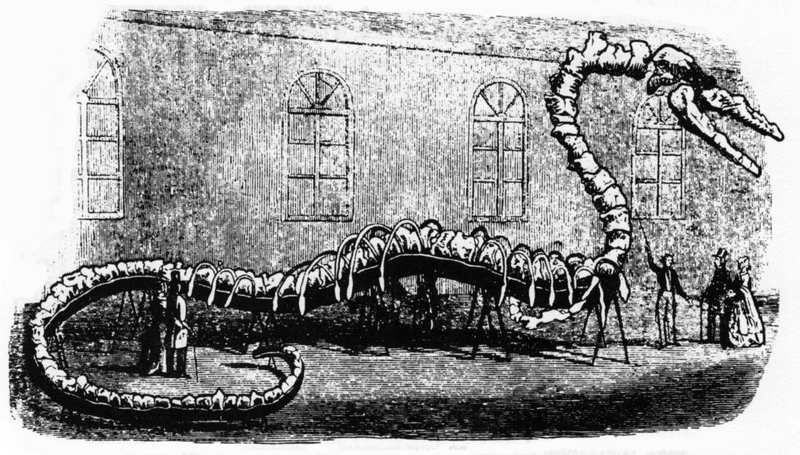 In 1848 he completed a second Basilosaurus composite, this one 96 feet long, and again took it on tour. The Mark II Hydrarchos would eventually be sold to Colonel Wood’s Museum in Chicago. E.L. Wood’s “museum” was yet another exhibition of mostly-bogus oddities, like Koch’s original operation in St. Louis. Still, the Basilosaurus mount’s final home can be credited for correctly identifying it as a prehistoric whale. The composite mount was labeled as “Zeuglodon”, a junior synonym coined by Richard Owen when he determined that the Alabama fossils belonged to marine mammals, not reptiles. Properly identified or not, the mount was destroyed along with the rest of Wood’s Museum during the great Chicago fire in 1871. Most of the original Hydrarchos was lost during World War II, although some parts remain at the Humboldt Museum in Berlin. Koch’s fossil mounts were frustrating to 19th century paleontologists because they cast unnecessary doubt on their young discipline. The actual bones that made up Missourium and Hydrarchos were genuine, Koch had merely assembled them incorrectly to enhance the appeal and profitability of his displays. To the scientists’ chagrin, when they criticized Koch’s displays, the popular press and the public often misinterpreted their statements and became skeptical of fossil finds in general. During the 19th century, ideas like extinction and the great age of the Earth were very new, and Koch’s spurious commodification of hard evidence made it harder for legitimate researchers to be taken seriously in the public sphere. In fact, modern paleontologists still have to do damage control when the occasional forgery turns up. In 1999, the discovery of “Archaeoraptor” was widely publicized in National Geographic magazine and elsewhere as a feathered dinosaur that provided important evidence for the dinosaurian origin of birds. Archaeoraptor was not the first feathered dinosaur ever found, but it was one of the early ones, back when the concept of dinosaurs with feathers was still news. Unfortunately, it was only after the National Geographic article had gone to press that paleontologists Xu Xing and Phil Curie determined that the Archaeoraptor specimen, which had been smuggled into the United States from China by an unknown dealer, was actually a composite. Someone in China knew that a complete skeleton was worth more than an incomplete one, and cemented together partial skeletons of several dinosaurs, including Microraptor and Yanornis. When National Geographic retracted the story, however, many readers misunderstood the extent of the forgery. They thought that the feathers, the most exciting part of the find, had been faked, when in reality all the parts of Archaeoraptor were quite real, they just belonged to different animals. This image of Hydrarchos provides a good look at the mount’s wooden armature. Incidentally, the above caption is accurate. Out-of-copyright image via Laelaps. More than ten years later, writers with creationist agendas and a few scientists who ought to know better are still pushing the myth that Archaeoraptor was a deliberate hoax. Literally hundreds of genuine feathered dinosaur specimens found since then contribute to the scientific consensus that birds area incontrovertibly dinosaurs. And yet, paleontologists are still fighting skepticism inspired by the Archaeoraptor mistake. 19th century paleontologists paid for Koch’s displays in much the same way. Editorials denouncing evolution and the fossil record repeatedly referenced Koch’s ridiculous chimeras, as though these showpieces were representative of paleontologists’ work. I suspect that the general animosity paleontologists of the era felt toward fossil mounts came from dealing with Koch’s legacy. O.C. Marsh, for instance, hated the idea of mounting fossils and refused to let any of his finds be displayed in such a way during his lifetime. It would not be until 1868 and the discovery of the first somewhat complete dinosaur remains that paleontologists would again see mounting as a legitimate means for displaying their finds. Carpenter, K., Madsen, J.H. and Lewis, L. (1994). Mounting of Fossi Vertebrate Skeletons. In Vertebrate Paleontological Techniques, Vol. 1. Cambridge, UK: Cambridge University Press. Rogers, M. 2010. Delia’s Tears: Race, Science and Photography in Nineteenth Century America. New Haven, CT: Yale University Press. Simpson, G.G. 1942. The Beginnings of Vertebrate Paleontology in North America. Proceedings of the American Philosophical Society. 86:1:130-188.